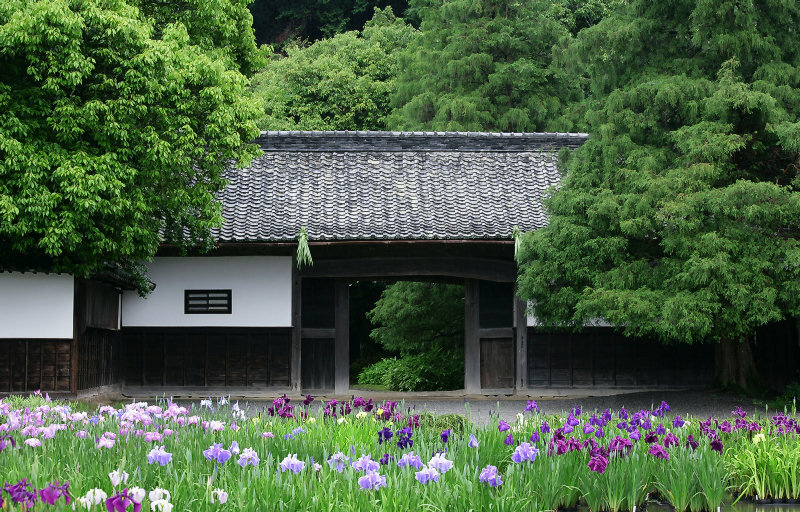 Today, May 30th, we focus on Kamo Garden, a sister garden of Kakegawa Kachoen about 20 minutes drive. 5월30일 오늘은 카케가와화조원에서 20분정도 운전거리에 있는 자매원—카모꽃창포원을 소개드리겠습니다. 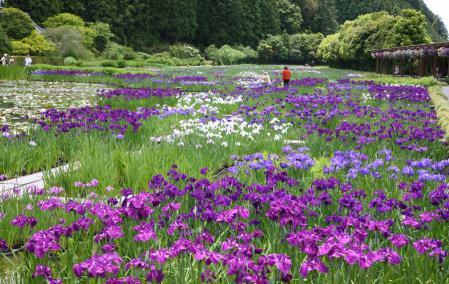 View of the Japanese Iris Garden of Kamo Garden on May 28th. At the end of May, the iris are at the beginning of their best. 5월28일에 촬영한 카모꽃창포원원내.5월말에 들어서자 꽃창포자 점점 예쁘게 피기 시작했습니다. The flowers are at their best until mid June. The Garden is open until June 27th. 지금으로부터 6월중순넘게까지가 꽃창포가 가장 아름다울 시기입니다.카모꽃창포원은 6월27일(일요일)까지 오픈입니다. Kamo Garden is in the northeastern part of Kakegawa city, near border between the city and Enshu-Mori town. 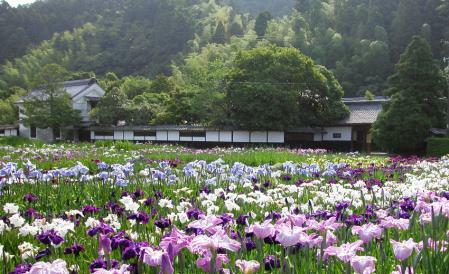 Though not specially large about 1ha in area, it is famous worldwide as one of the best Japanese Iris Garden in Japan, for beautiful combination of peaceful rural scene, village headman's palace Kamo Palace and iris blooming in front of it. 카모꽃창포원은 카케가와시와 엔슈모리마치와의 사이 즉 카케가와시의 서북부에 위치하여 있습니다.원내 면적은 약 1헥타르정도로 아주 큰건 아니지만 산을 뒤로하고 ,에도시대에 건축된 쇼야야시키 카모소의 문앞에 넓게 핀 꽃창포가 조화롭게 어울려 일본에서는 물론 해외에까지 알려지고 있습니다. The Garden opened in 1955, seeing 55th anniversary this year. It is extraordinary long-life for a private garden for sightseeing purpose. 카모꽃창포원은 쇼와30년에 오픈하여 지금까지 약 55년이란 세월을 지내왔습니다.개인이 운영하고 관광원으로서는 긴 역사를 갖고 있다고 할수 있지요. 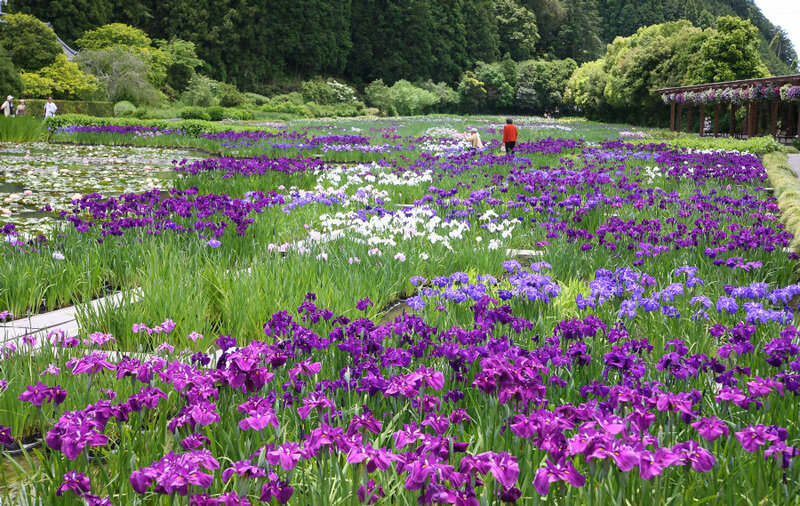 However, the Group stood on the Iris Garden alone only until the end of 1980's. Mototeru Kamo, the present president of the Group, foresaw that and built Fuji Kachoen in Fujinomiya city, Shizuoka Prefecture about 20years ago, and introduced owls there several years later. 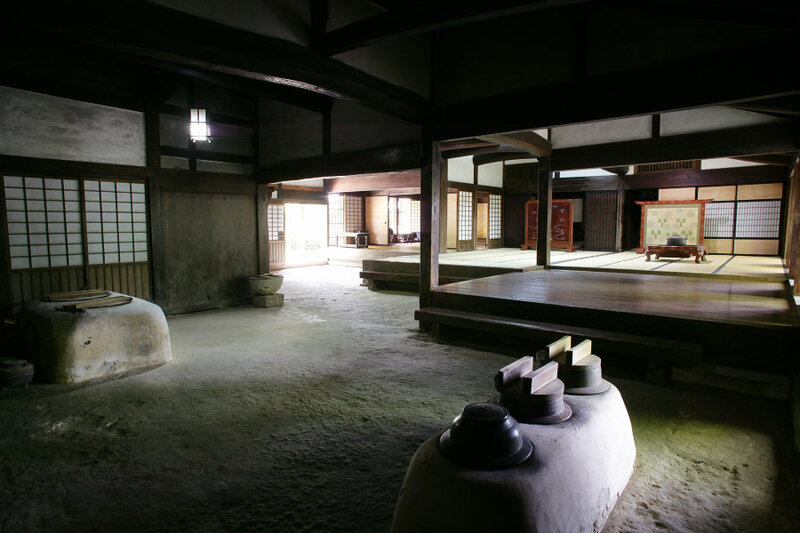 Since then, gardens in Kachoen style such as in Matsue, Kakegawa, Kobe developed, serving as breadwinners of the Group today. 하지만 꽃창포만으로 경영을 해온건 1980년말기까지였습니다.오랜 시간 지켜보고 오시던 현재의 사장 카모모토테루는 약 20년전에 시즈오카현 후지미야시에 현재의 후지화조원을 세워 그 몇년뒤에 꽃창포원에 부엉이를 도입했습니다.그뒤로 마쯔에,카케가와,고베화조원이 이어서 일어나게 됬고 지금은 그 화조원들이 카모그룹의 경영주력으로 되였습니다. Kamo Garden, as the origin of the Group, and as the source of concept of harmony and cohabitation with the nature and wildlife, makes the Japanese Iris, including the cultivars bred by our own, in bloom in rural circumstance, treating visitors with traditional meals in the Edo era. 카모꽃창포원은 당그룹의 원점으로서 자연과 생물의 조화로운 공존을 리념으로 하는 당그룹의 원점으로서 산속에서도 매년 꽃창포를 재배하고 에도시대로부터 전해내려온 요리를 손님게 접대하며 독자적으로 개량한 꽃을 전시하고 있습니다. Namely, the Garden keeps the soul of the Group. 즉 당그룹의 근거지로서 정신적인 부분을 책임지고 있습니다. For example, this Nagayamon Entrance that was built in 1773, mid Edo era, has been a symbol of the Kamo Family, and now its style was inherited to the main entrance of Kakegawa Kachoen and other affiliated gardens. 예를 들면 지금으로부터238년전의 에도시대중기에 건축된 카모소의 나가야몬은 카모집의 상징으로 되여 카케가와화조원을 비롯한 본그룹의 각 원의 정면에는 나가야몬이 있는 전통이 있습니다. Inside of the palace is well-preserved in Edo era style. The palace has often been chosen as a site of location of movies et al..
건축내는 에도시기의 모습이 그대로 보존되여 있어 최근은 영화촬영지로도 가끔씩 쓰여지고 있습니다. 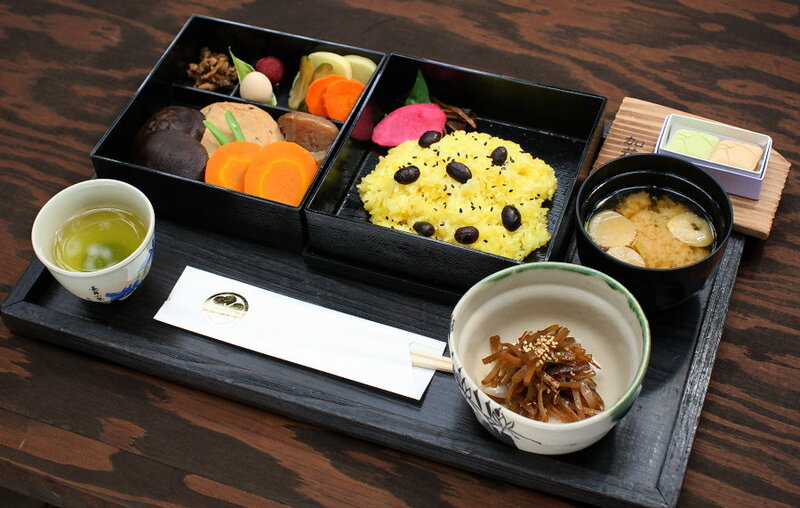 The Garden serves visitors Shoya-Ryori dishes, traditional meals inherited by Kamo Family since Edo era, only during the Japanese Iris season. 또 에도시대부터 카모집에서 전해져내려온 전통요리—쇼야요리등도 꽃창포의 오픈시즌에만 손님께 대접해드리고 있습니다. These simple and frugal meals are preservative-free, made in traditional method by staff members with wild vegetables harvested at surrounding fields, oroginal pickles including Shoyu-no-Mi and miso et al..
예로부터의 소박한 요리지만　당원의 스탭이 근처의 산에서 캐온 야채로 나물을 무치고 미소,간장열매 등 장기간 보존한 재료를 사용하지 않으며 모든걸 옛전통 그대로 제조하는 것을 견지하고 있습니다. 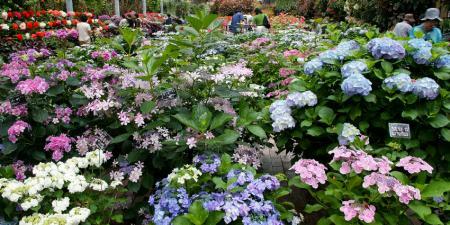 Furthermore, "Kamo Selection" series of Hydrangeas, that have been bred independently by the Garden, put on sale at garden shops and gained high popularity this year, are displayed and sold at in a grenhouse about 3000 square metres in area. 그외에 원내의 3000평방미터의 온실내에는 당원에서 독자적으로 개량한 오리지널 수국을 전시하고 있는데 손님으로부터 인기가 많아 올해부터는 원예숍,홈센터 등에서도 판매되고 있으며 당원에서도 판매를 시작하였습니다.